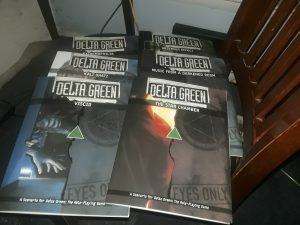 In the mail: A bunch of Delta Green books. 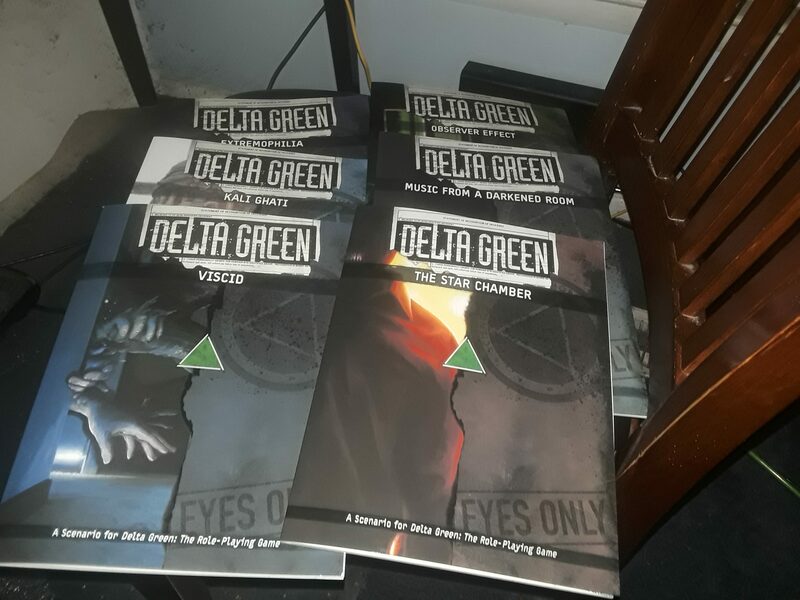 To be fair, these are all print versions of the Delta Green Kickstarter PDFs that got made; they were originally supposed to be just available in PDF, but I guess Arc Dream figured out how to print them cheaply enough. Anyway, they offered five bucks off per book, so I just started grabbing. And wasn’t it a fun exercise in getting them, too. Long story, and it got resolved to my satisfaction, so I’m not gonna tattle on anybody. In the e-mail: Delta Green: Handler’s Guide. Delta Green: Handler’s Guide is the GM guide for the Delta Green RPG itself; and when you’ve been a fan of the game for as long as I have, the updating of the backstory alone is going to be worth it. A lot of stuff has gone down in the Delta Green universe since the 1990s. And, as would be appropriate for a Cthulhu Mythos game, things have gotten worse. I have some fun Halloween reading to look forward to. I was going to order this Delta Green patch, but now I don’t know. There’s something about it that doesn’t appeal. I mean, yes, it’s an asymmetrical design that’s supposed to be evocative of medieval ritual magical symbols (hidden as a government logo); and if I’m remembering my Latin right the motto is brutally honest for that game world. I get all of that. But it’s still just a little unsettling. Weird. Guess that they did their job properly with the design, huh? Tweet of the Day, I’ve Never Gotten Into Audiobooks… edition. …but I know that people who read me do get into audiobooks. And I did read and like Delta Green: Tales from Failed Anatomies. Heck, I’d hope that I would; I did the Kickstarter for it. So check this out. PS: I’ve actually wondered from time to time why I don’t get into audiobooks. Maybe I like going back and checking the text too much? It’s hard to do that with audio. At least I perceive it as being hard. Tweet of the Day, Successful #DeltaGreen Op On Atlanta’s I-20 edition. Ooh, crossover adventures! It’d be a memorable game. And a short one, too. Alas, it did not win the Delta Green 2016 Shotgun Scenario contest. Heck, it didn’t even get a vote (I was competing, so I didn’t think that it was appropriate that I vote for mine). There was a missing sentence at the end and I needed to tighten it up a bit here and there before putting it up now, so that’s fair. Voting is now open on the Delta Green Fairfield Project Shotgun Scenarios contest. Details found here and here. Please note that the submissions are anonymous, and will continue to be so until after the voting is complete. If you decide to sign up to the Delta Green mailing list in order to vote – since I have a submission, I will not be voting – please respect all the rules. Today is the last day of the Delta Green Shotgun Scenario contest.